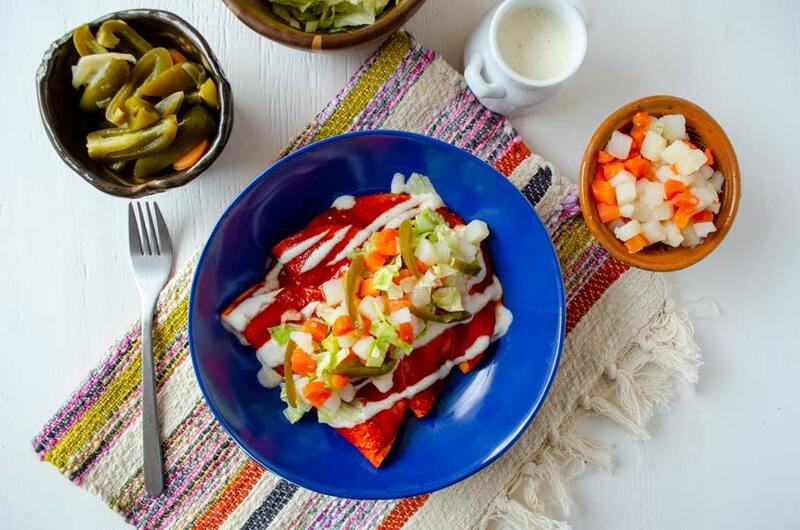 These are Guanajuato’s famous Vegan Potato Enchiladas (Enchiladas Mineras) filled with a sautéed onion and mushroom mix, smothered in a guajillo enchilada sauce, and topped with tender potatoes and carrots, crema, shredded lettuce, and jalapeños en escabeche. Enchiladas are one of those Mexican dishes that have an infinite number of variations depending on the region. 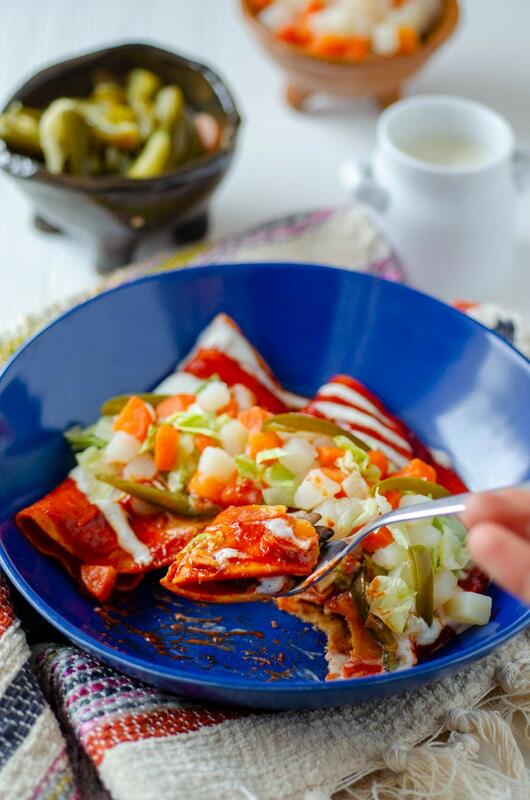 These easy vegan enchiladas are called enchiladas mineras or miner’s enchiladas, because Guanajuato was once the world’s silver-extraction center (18th century). Guanajuato is a state in central Mexico, its capital, the city of Guanajuato is a UNESCO world heritage site, famous for its beautiful examples of Baroque architecture. My name is Enrique Rodriguez and I’m from the city of Irapuato in the state of Guanajuato, and I have been vegan for more than 4 years. Ever since I was a child I wondered what vegetarianism was all about and always declared myself a lover of animals. So much so, that I stopped eating fish, because my first pets were fish, except for tuna in a can, probably because I couldn’t see the fish’s corpse, hahaha. As an adult, I met a group of animal activists in Irapuato, and that’s how it all started. I began researching veganism and in one week I stopped eating all animal products. It was easy for me, since I didn’t really like eating meat to begin with, and I learned to substitute it with beans and vegetables such as garbanzos, lentils, mushrooms, etc. My love for cooking and animals grew, and I began to veganize every recipe I came across, and now this lifestyle will accompany me forever. Traditionally this recipe uses quite a bit of oil. I have opted for a healthier version, but if you don’t mind the oil you can follow the traditional methods. To do so, after dipping the tortilla in the sauce fry them lightly in a large sauteé pan with 1 tbsp. of oil. 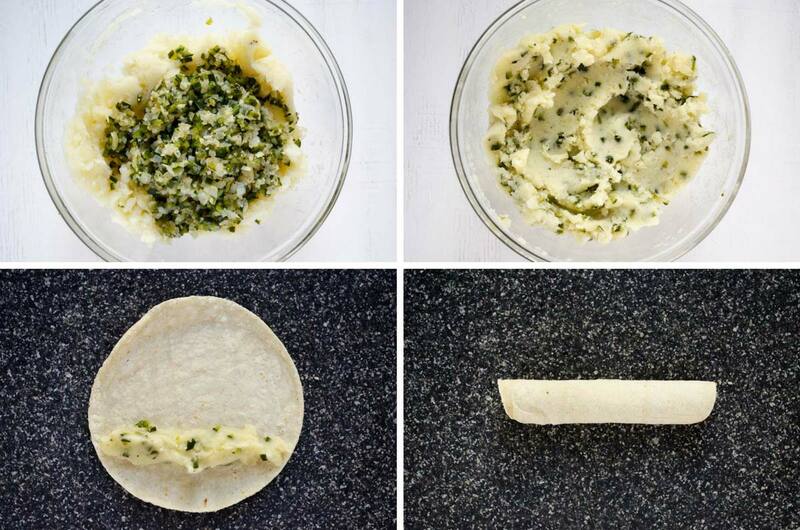 Fill the tortilla then fold in half. In the same pan you fried the tortillas fry the potato and carrots. If you are allergic to nuts you can make a tofu crema by blending: 1 lb. of silken tofu, 2 tbsp. lemon juice, 1 clove of garlic, 1/3 cup of water or unsweetened almond milk, 1 tsp. of nutritional yeast, and salt and pepper to taste. The enchilada sauce is not very spicy, so if you like spicy food add 1 to 2 chiles de arbol to the sauce. On a skillet or comal set to medium heat, toast the guajillo chiles for a couple seconds on each side. Place the chiles in a large bowl and cover with boiling water. Let sit for 10 minutes. Place the soaked chiles, garlic, cumin, oregano, and 2 cups of the chile soaking liquid and process until smooth. Strain and season with salt and pepper. Set aside. Add ¼ cup of water or vegetable stock to a large sauté pan set to medium-high heat. Add mushrooms and sauté for 5-6 minutes, or until almost all the moisture has evaporated from the mushrooms and they are beginning to brown. Add more liquid if necessary. Add the onion and garlic and continue cooking until the onion is tender and translucent about 6 more minutes. Add more liquid as necessary. Season with salt and pepper and set aside. Place potatoes in a medium saucepot with cold water and salt. Bring to a low simmer and let cook for 5 minutes, add carrots and let cook for 3 to 4 minutes more or until the potatoes and carrots are tender. Strain and set aside. Bring enchilada sauce to a very low simmer in a medium saucepot, dip a tortilla in the warm sauce, very quickly, and place on a plate. Fill with mushroom mixture and vegan cheese and fold the tortilla over. Place on serving platter. Repeat this process with the rest of the tortillas. Pour some extra sauce on top of the enchiladas and spread with a spoon. Place in oven for 5 to 6 minutes to melt the vegan cheese. (You can omit this step if you’re not using cheese). Remove from oven. Top enchiladas with the potato-carrot mixture, shredded lettuce, jalapeños en escabeche, and drizzle crema on top and serve. 02/15/2019 /1 Comment/by Dora S.
What doesn’t go well with mole?? I don’t know, but I’m willing to test every possible combination to find out. 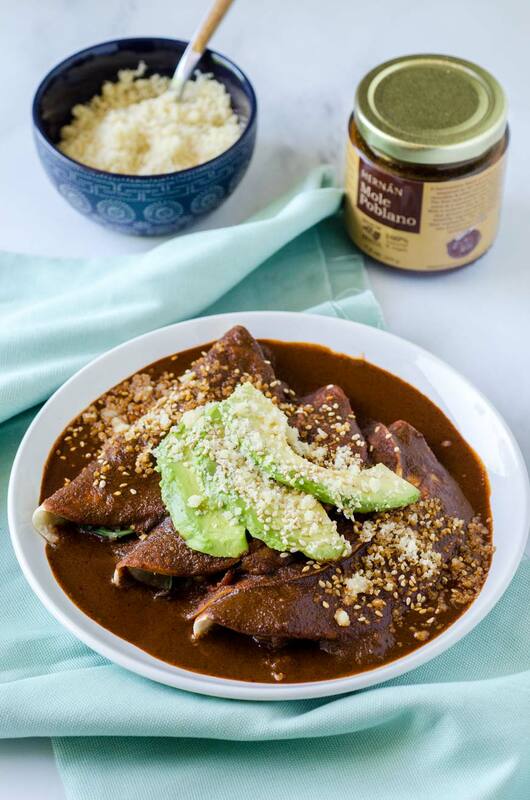 Either way, you can’t go wrong with enmoladas (also known as mole enchiladas), filled with braised greens and potatoes, and topped with avocado slices, vegan cotija, and toasted sesame seeds. 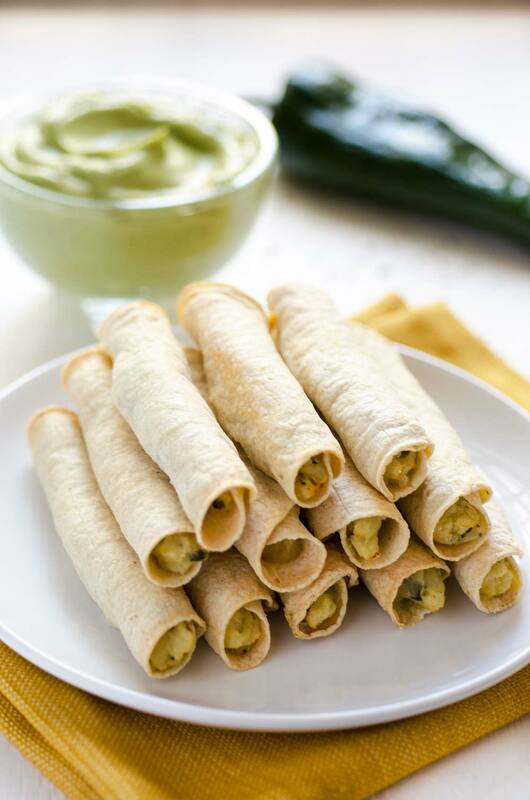 Once again I have partnered with Hernán mole to make this recipe super easy, and convenient. I have a confession to make: I probably have only made mole 3 times in my life! Making mole isn’t hard, but it is terribly time consuming, and requires over 15 different ingredients! That’s why I love using Hernan mole. In less than thirty minutes I can have dinner on the table. It’s harder than you think to find a mole paste that is completely vegan and free of additives or preservatives. If you do find yourself in Mexico ask before eating mole, since it is often made with lard and chicken stock. Mole enchiladas is one of my go to dinners. I have filled these with braised greens and potatoes, but you can also fill them with zucchini and black beans, roasted poblano pepper and corn, or mushrooms and greens. 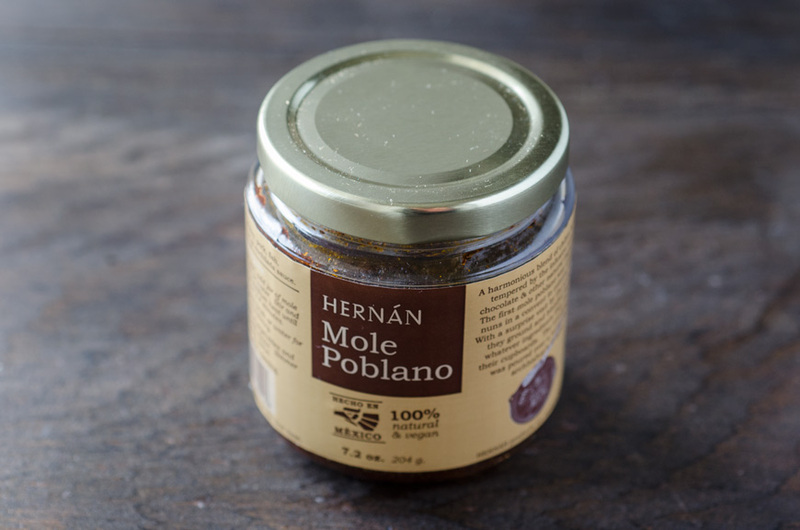 If you want to give Hernan Mole a try be sure to visit their site. Use corn tortillas. Flour tortillas become very gummy when soaked in sauce. You can use any leafy greens you prefer such as spinach, kale and swiss chard. Make sure not to over cook the potatoes or you’ll end up with mashed potatoes and greens. You can also top this with almond crema. Mole enchiladas (enmoladas) filled with braised greens and potatoes, and topped with avocado slices, vegan cotija, and toasted sesame seeds. Super easy and delicious! Fill a medium pot with cold water and add potatoes. Bring to a simmer over medium heat, and let cook for about 6 minutes or until the potatoes are tender, but not mushy. Drain the potatoes and set aside. While the potatoes are cooking, heat a large sauté pan to medium-low heat and add the onion. Cook the onion for 3-4 minutes or until it is tender and translucent. If the onion begins to stick, add some water or vegetable stock to the pan. Add the garlic and let cook for 2 more minutes. Add greens, and if necessary add more vegetable stock. Mix well. Once the greens are cooked, add the potatoes, season with salt and pepper and stir. Set aside. In a medium sauce pot bring one cup of vegetable stock to simmer over medium heat. 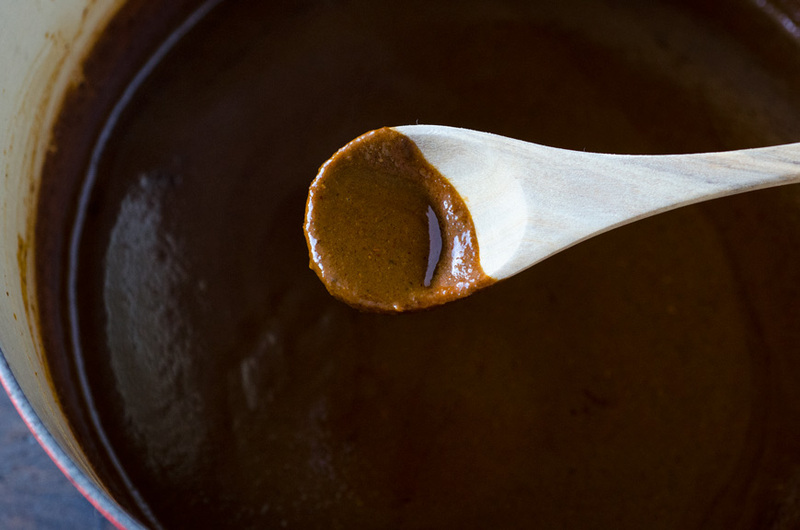 Add in mole paste and stir with a wooden spoon until the mole paste is dissolved, about 3 – 4 minutes. Pour in 1 more cup vegetable stock and stir. Once the mole reaches the desired consistency remove from heat. Add as much vegetable stock as necessary. Wrap the tortillas in a moist paper towel and place in the microwave for 30 seconds. Repeat until the tortillas are warm and flexible. Using a large serving spoon, pour mole on each plate and spread to cover the width of the plate. Place 3 filled tortillas on top of the sauce on each plate, then cover with more sauce. 10. Top with avocado slices, toasted sesame seeds, and vegan cotija. Serve immediately. Use corn tortillas. Flour tortillas become very gummy when soaked in sauce. You can use any leafy greens you prefer such as spinach, kale and swiss chard. Make sure not to overcook the potatoes or you'll end up with mashed potatoes and greens. You can also top this with almond crema. 05/04/2018 /0 Comments/by Dora S.
Every country across the world has its own way of celebrating Christmas. 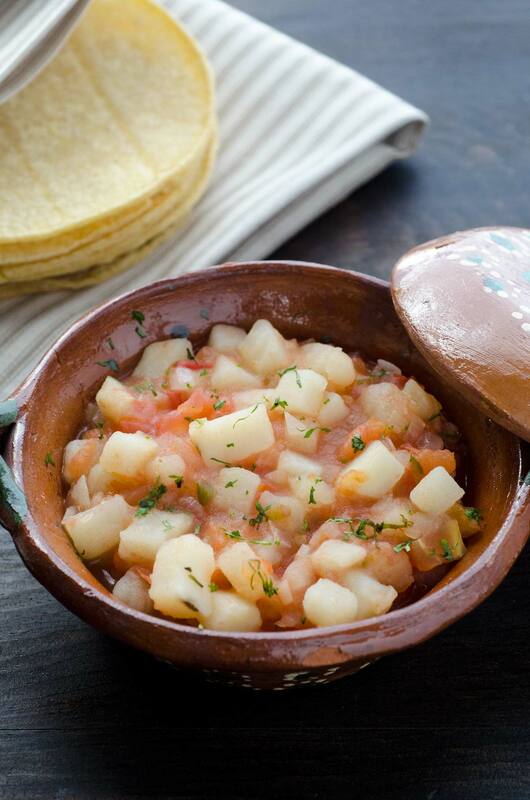 Mexico has many wonderful Christmas traditions, but one of the most important is the food. It’s not Christmas without pozole, tamales, buñuelos, or ponche. 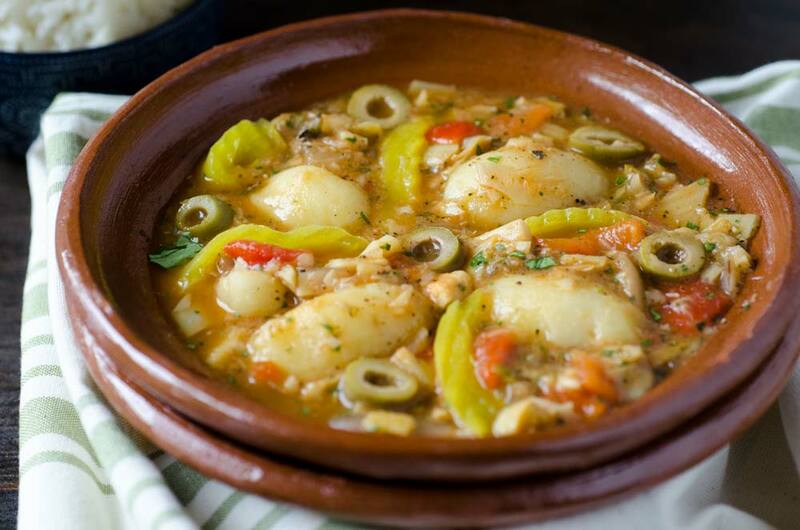 Another one of those important dishes is this vegan Bacalao a la Vizcaína. 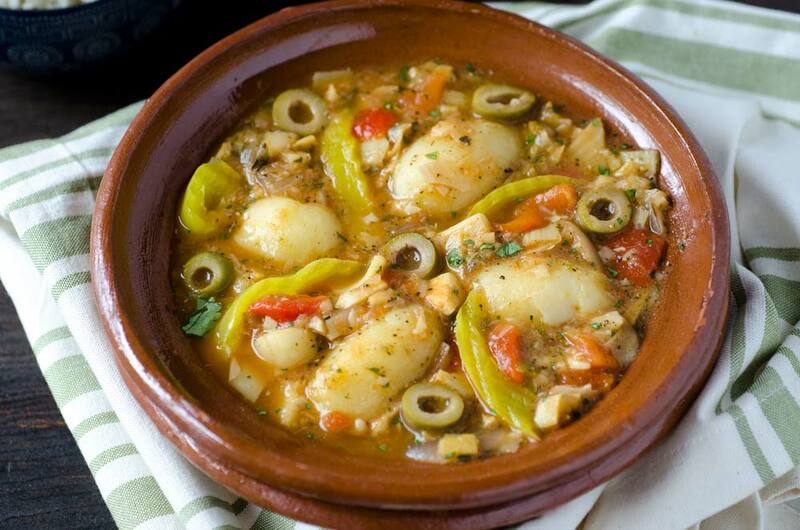 Bacalao a la Vizcaína is a braised salt cod dish with tomatoes, garlic, olives, capers, roasted peppers, and potatoes. Depending what part of the country you are in they also add raisins and slivered almonds. For this vegan version I️ have used mashed chickpeas to replace the salt cod. The dish is an adaptation of a Spanish classic, and is mostly consumed in central and southern Mexico on Christmas Eve. Serve it with rice or crusty bread to soak up to the last drop of the stew. What are some of your favorite Christmas foods? 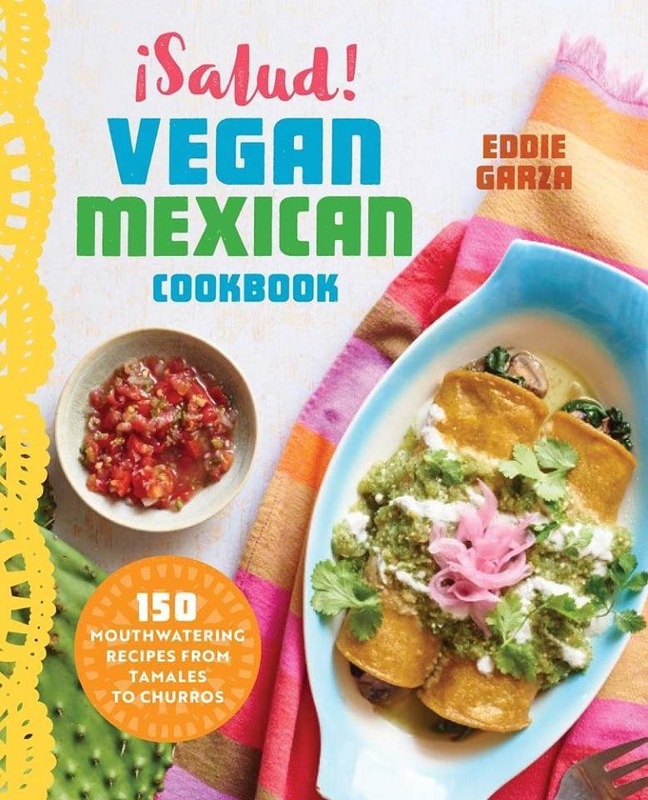 My favorite is without a doubt tamales, and the are super easy to veganize! My favorite Christmas traditions are decorating the tree as a family, pedir posada, and singing Happy birthday to Jesus, and then having the kids kiss little baby Jesus on Christmas Eve. Ok, so there’s a lot of stuff I️ like about Christmas! I️ would love to hear some of your traditions. or finely chopped nori seaweed. Enjoy! 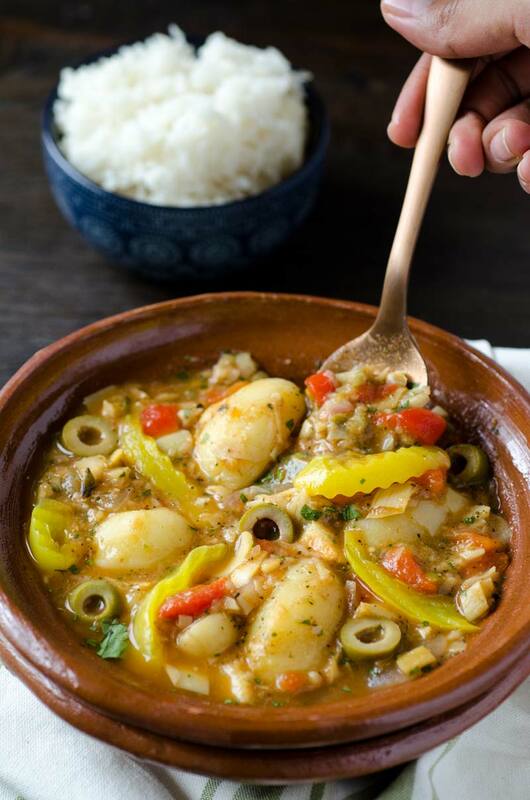 This vegan bacalao a la vizcaína is an adaptation of a Spanish classic, and is served in central and southern Mexico on Christmas Eve. Preheat oven broiler to HI. Place tomatoes on a sheet try and place under the broiler for 4 minutes, until the tomatoes begin to brown and be covered in black spots. Turn the tomatoes and leave in oven for 4 more minutes. Remove from oven. 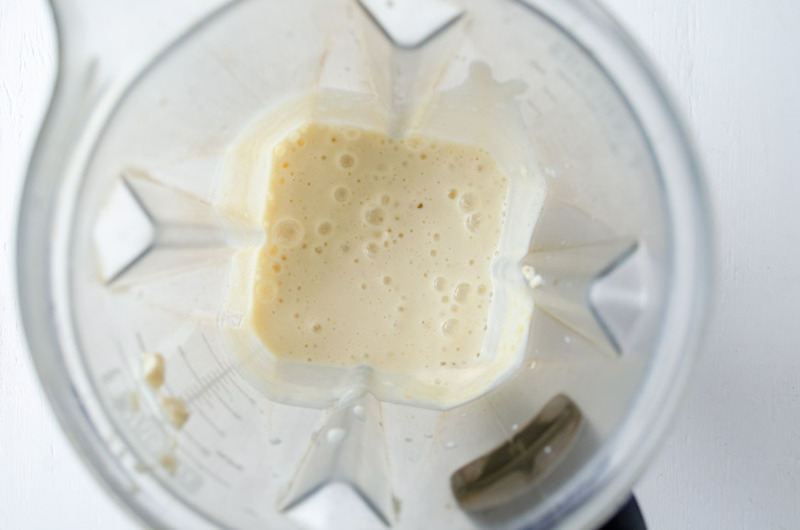 Using your blender, process until you have a smooth puree. Strain and set aside. Heat a large pot to medium-low heat and add ¼ cup of water. Add onions and let cook until tender and transparent, about 4 minutes. Add garlic, and cook for 1 more minute. Pour in tomato puree, and bring it up to a simmer. Add chickpeas, olives, capers, red peppers, bay leaf, and nori flakes. Continue to simmer for 5-6 minutes. Stir well. Add parsley, potatoes, pickled banana peppers. Let simmer for 8 more minutes. 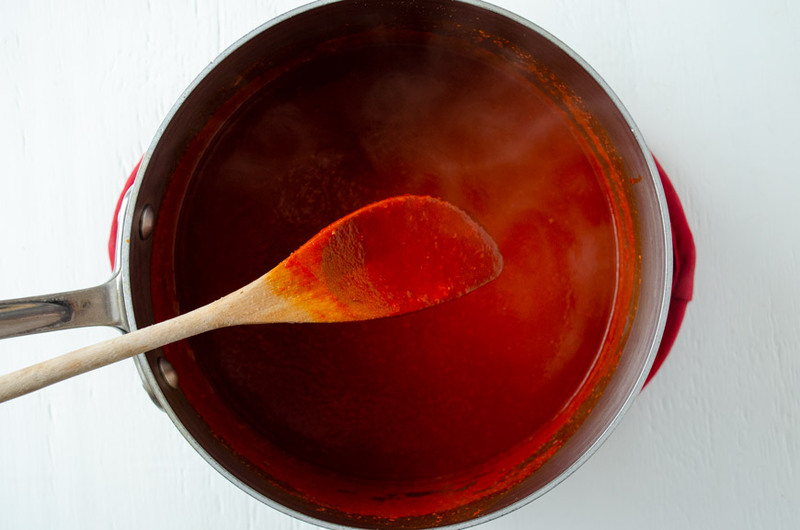 If the sauce thickens too much, adjust with vegetable stock or water. If you are looking for a fishy taste use 2 tsp. of nori flakes. Serve with rice or crusty bread. The pickled pepper can be spicy or mild depending on your preference. In some states they add raisins and slivered almonds, you can add those as well. If you would like to add more texture to the dish you can add hearts of palm or artichoke hearts. Disclaimer: This post contains affiliate links, meaning at no additional cost to you, I will earn a commission if you click through, and make a purchase. Thank you for your support! 12/05/2017 /0 Comments/by Dora S.
The incredible Ale Graf, from the blog Piloncillo & Vanilla, is doing a guest post for me this week while we continue our new baby bliss here in the Stone household. ¡Thank you Ale! 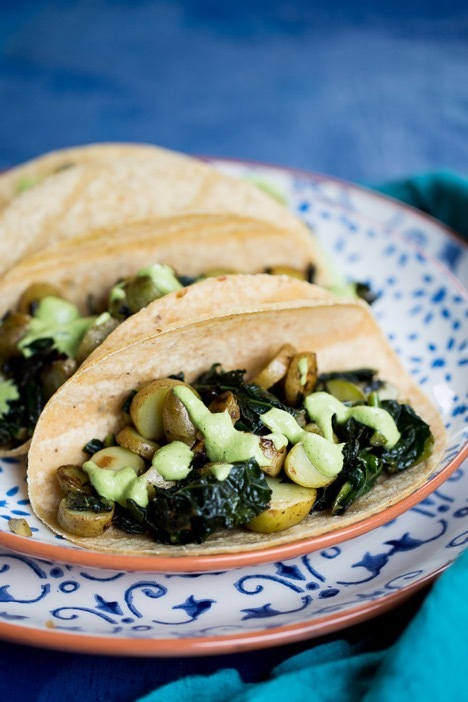 These kale potato tacos topped with cilantro cream sauce are the easiest thing in the world to make, they are also delicious and nutritious. 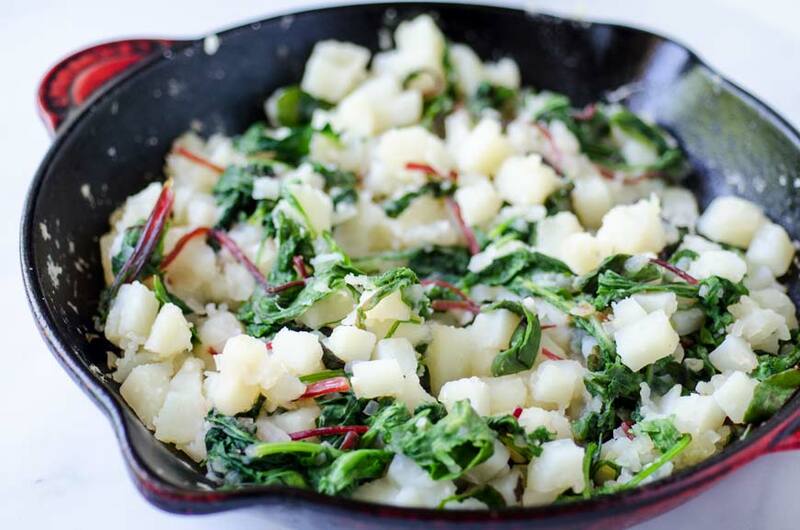 Imagine, that with each bite you get the full flavor of the potatoes, the texture of the kale, and the explosive flavor of the cilantro cream sauce…..yum! Sometimes I draw a blank and I can’t figure out what to make for lunch or dinner. I open the fridge three hundred times and I just can’t seem to figure it out, but the truth is making a delicious lunch or dinner doesn’t have to be that hard. I made these tacos for the first time on one of those days, when I kept opening the fridge and didn’t feel like cooking at all. Which is rare, because I always feel like cooking. But when the onion sizzled in the sauté pan and the aroma hit me, everything changed. That’s when I knew that what I really wanted to eat was tacos, like the good Mexican that I am. 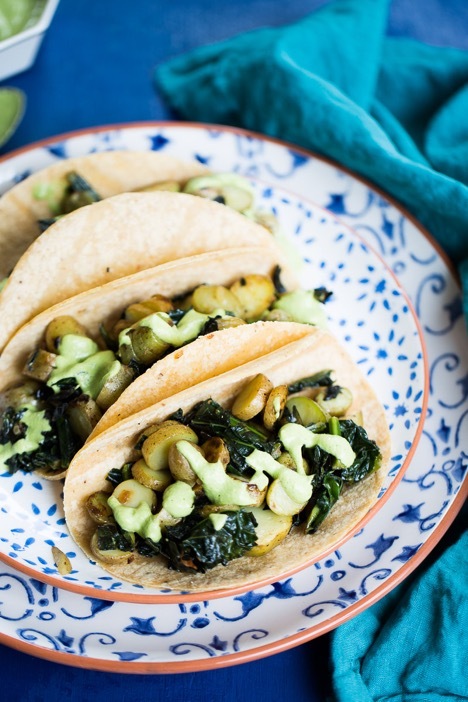 Once the onion was tender and transparent, I added the potatoes, and that’s when I realized that kale was the perfect addition to these tacos. I always try to add greens to everything I cook, it’s a really easy way to consume them and this way you don’t have to eat them only in salads. Greens go well with everything. I like to add them to soups and sandwiches. Anyway, once the potato and kale mixture was ready I decided to make the cilantro cream sauce. This cilantro cream sauce can be prepared in one day and it keeps up to one week in the refrigerator. It’s one of those sauces that pairs really well with everything and brings out other flavors. I am leaving the recipe below, I hope you like it, and that it will be useful on those days when you just don’t know what to make for dinner. Heat a large sauté pan to medium heat, add oil and onion. When the onion is translucent and tender add the potatoes. Cook for approximately 10 minutes or until the onion and potatoes are golden brown. Add the kale and salt and continue cooking until the kale and potatoes are tender. In the meantime, place the onion, soaked cashews, cilantro, chile serrano, lime juice, water, and salt in the blender and process until smooth. Taste and adjust seasoning as necessary. To make the tacos, heat the corn tortillas, add 2-3 tbsp. of the kale and potato mixture and top with a tsp. 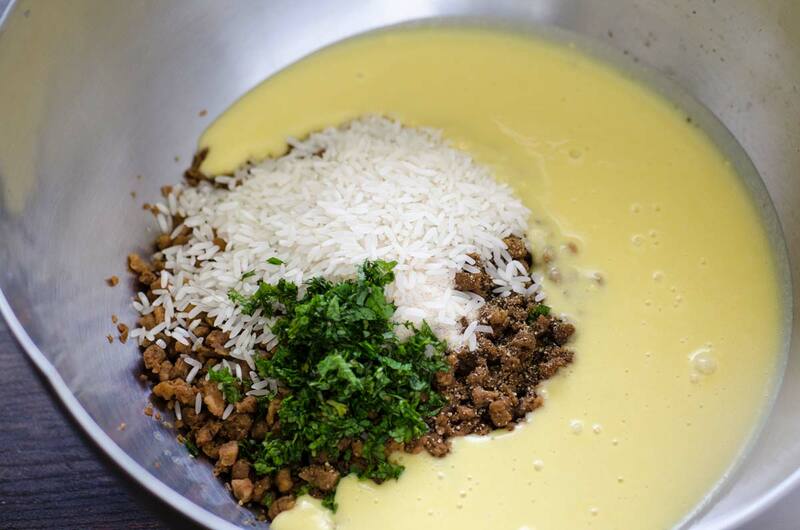 of cilantro cream sauce. 07/18/2017 /0 Comments/by Dora S.
Have you heard of a California burrito? If you haven’t been to California you are seriously missing out. 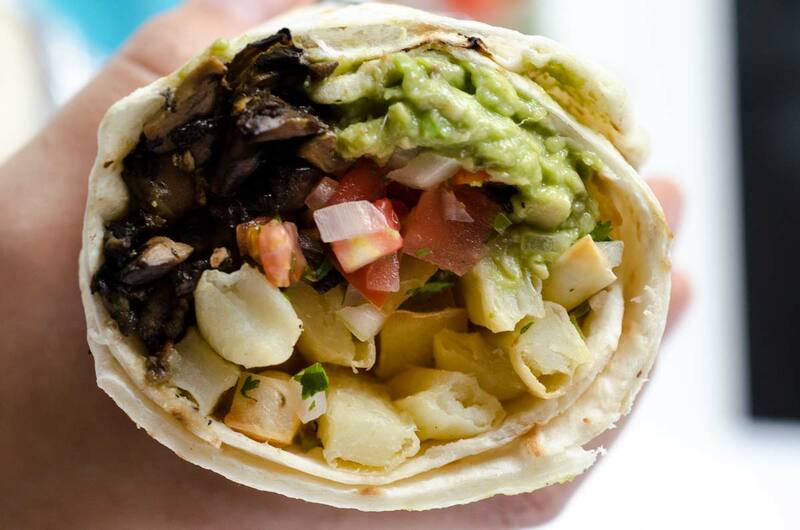 This vegan California burrito is stuffed with oven baked french fries, pico de gallo, portobello asada, spicy salsa, vegan cheese, and guacamole. It is the perfect meal after a long day surfing on a sunny beach. I must confess that when I first moved to California a couple of years ago, I was puzzled by this behemoth of a burrito, but somehow this strange combination works! I am still in Mexico, and finding a flour tortilla large enough to make this burrito was a huge challenge. None of the grocery stores seemed to have them. I had to go to a tortilleria and ask them to make them for me. Even then they were very confused. They kept telling me that the tortillas they already sold were perfect for burritos, and I’m sure they were, but they were pretty small. I had to demonstrate with my hands a tortilla the size of my head. They kind of looked at me like I was crazy, but they made a couple of tortillas for me. The burritos in my part of Mexico are more like slightly large flour tortilla tacos, nothing like the giant burritos you buy in the US, that’s why the ladies at the tortilleria were so surprised at my request. I hope you enjoyed the Easter holiday with your loved ones as much as I did. We had lots of family come in from out of town and had lots of fun and activities. I’m still exhausted! I had forgotten how wonderful and stressful it is to have a really big family. I had the opportunity to see some of my cousins that I hadn’t seen for years, and it was so nice to talk and have our children play together. I look forward to doing it again soon. I used portobello mushrooms, in place of steak, but you can use the recipe for the marinade on tempeh or seitan if you prefer. I also omitted the vegan cheese, because of my dislike for all vegan cheeses, but if you have a favorite brand you are more than welcome to add it to your burrito. (I would love to hear what your favorite brand of vegan cheese is.) 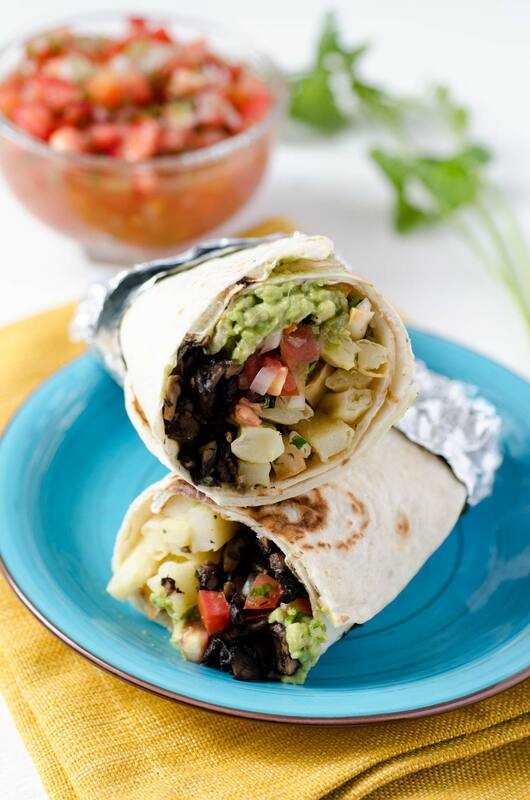 Make your burrito as big or small as you like and enjoy! Combine all the ingredients for the marinade in a Ziploc bac and add the sliced mushrooms to it. Let marinate for 1 hr. up to 24 hours. In a large bowl toss the potatoes with the flour and salt. 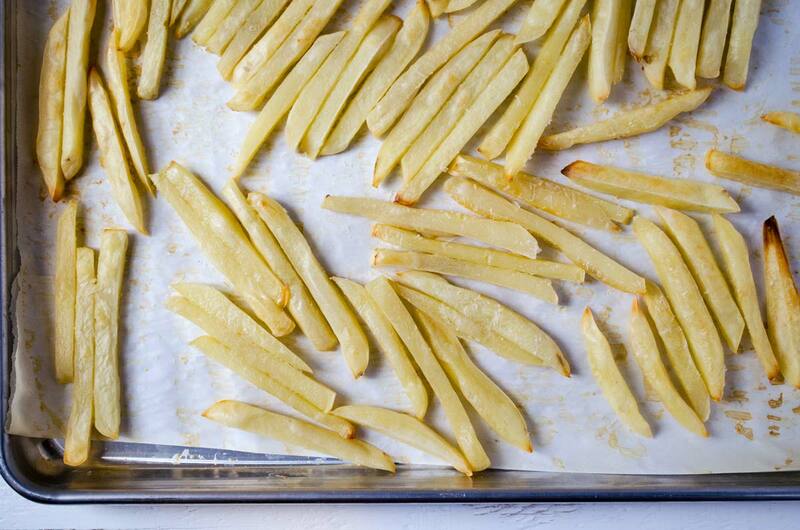 Arrange fries in a single layer on a sheet tray lined with parchment paper and bake for 15 min. then flip the fries and bake for 15 more minutes or until golden brown. Remove from oven and set aside. Mash the avocadoes and season with salt and pepper and a splash of lime juice. 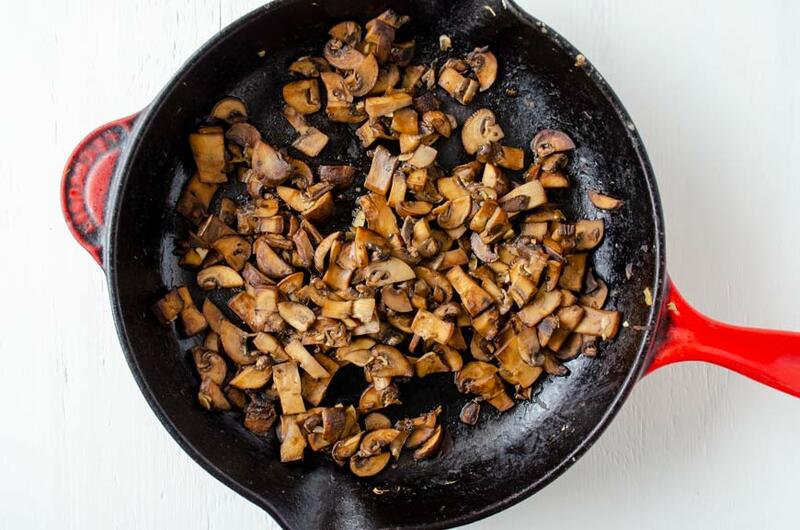 Heat a large sauté pan to medium-high heat, remove excess marinade from mushroom and add to the pan. 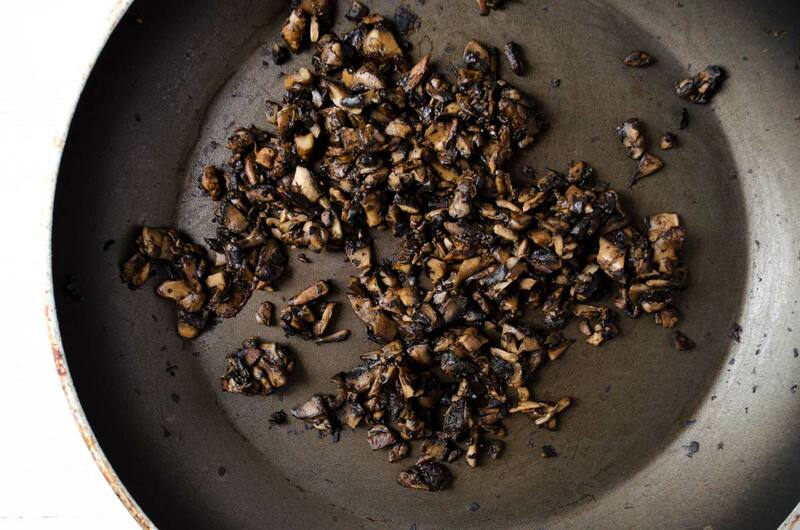 Sauté mushrooms for 6-8 minutes or until almost all the liquid has evaporated and the mushroom are golden brown. Set aside. Heat tortillas on a comal or griddle. Add baked French fries, mushroom asada, pico de gallo, guacamole, salsa, and vegan cheese. Roll into a burrito. If your burrito is really big you will have to secure it with aluminum foil. If you prefer, you can place your rolled burrito on the griddle or plancha and brown a couple of minutes on each side. You can use the recipe for the marinade on tempeh or seitan if you prefer. The vegan cheese is optional if you are a no-oil vegan. 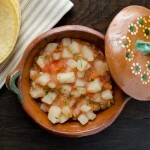 You can find a recipe for pico de gallo here. 04/20/2017 /2 Comments/by Dora S.
I didn’t think it was possible, but it is. 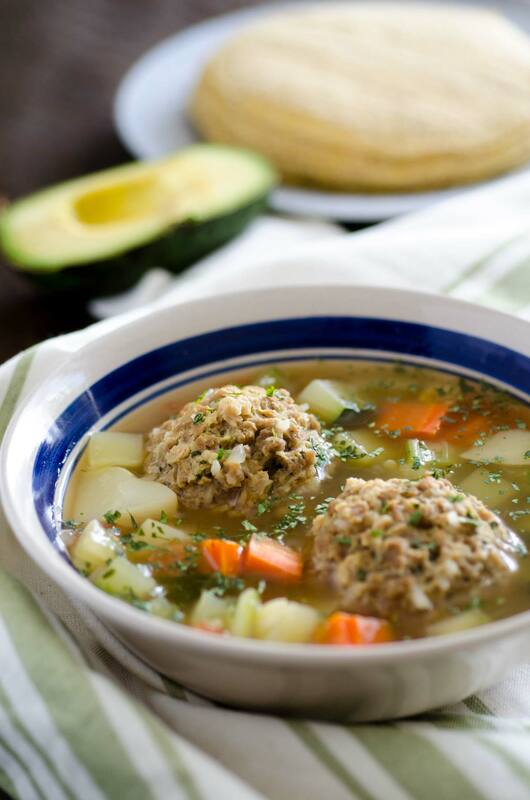 You can make vegan Mexican meatball soup! I happened upon an instagram account @vegan_mexican and they kept posting pictures of vegan Mexican meatball soup. I almost lost it right there and then. 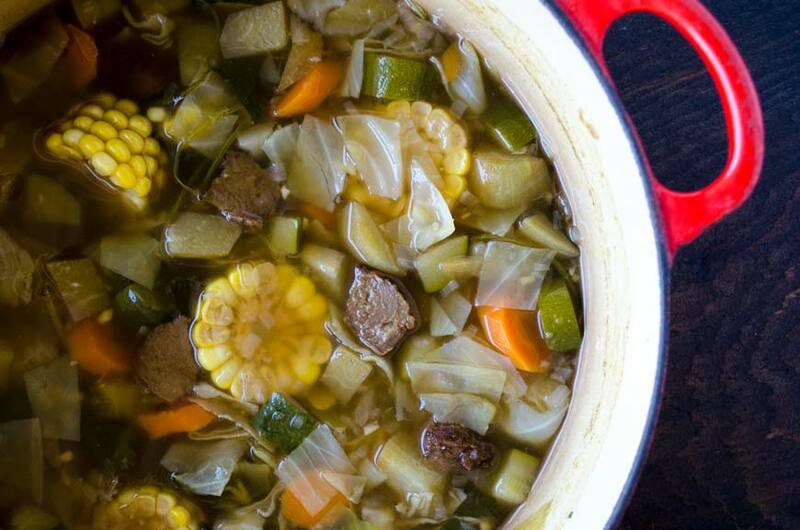 My grandma used to make this soup for me growing up and I have very fond memories of this. So naturally I contacted the account to see if they wanted to share the recipe with you and they said yes! Here is a small interview with the author of the recipe and instagram account, Brianna García. 1. Tell us more about yourself where you are from, and how you became vegan. My name is Brianna García and I’m from California. I reside in the Los Angeles/ Anaheim area. I became vegan after becoming interested in organic/natural living and knew that veganism was for me. I had previously gone vegetarian in my teens and had always wished I was vegetarian again didn’t think it was possible to go vegan until I made the plunge and I’ll never look back! I also love the animal and environmental friendly impact veganism has. 2. What do you think is your biggest challenge as a vegan? The biggest challenge I would say is convenience. It’s not difficult being vegan. There’s so many vegan options. I just wish there was vegan restaurants and vegan grocery stores on every corner like there is with a McDonalds. 3. The recipe is your moms. Is your mom vegan? How about the rest of your family? The non vegan recipe is my mothers. I asked her to show me how she made albondigas so that I could do my vegan take on it. I wanted it to be authentic as possible, but vegan. She isn’t vegan. However, I have helped her implement a lot more vegan/organic things into her diet. Nobody but my partner is vegan. 4. What are some of your favorite go to vegan recipes? My favorite go to vegan recipes are the ones that are quick to make when I’m lazy and hungry. I seriously love vegan potato tacos, and they’re so easy to make. All I had to substitute was the cheese for a vegan one. I usually make Gardein dinners quite often too. I also used to make organic vegan fruit smoothies a lot for breakfast. It’s amazing how delicious fruit tastes with no added terrible ingredients. 5. Where can people find you and your recipes? On my Instagram account at @vegan_mexican. Thank you Brianna for sharing your amazing recipe with us. My family really enjoyed it and it brought back sooo many memories. Brianna did an excellent job at making this recipe very detailed, so you shouldn’t have a problem at all following along. The recipe calls for two things that no matter what, you cannot substitute. Those are gardein beefless ground and the new follow your heart vegan egg. (This is not an ad. No monetary compensation is being provided by gardein or follow your heart.) If you don’t use these, your meatballs might fall apart while cooking, like mine did the first time I made this soup. 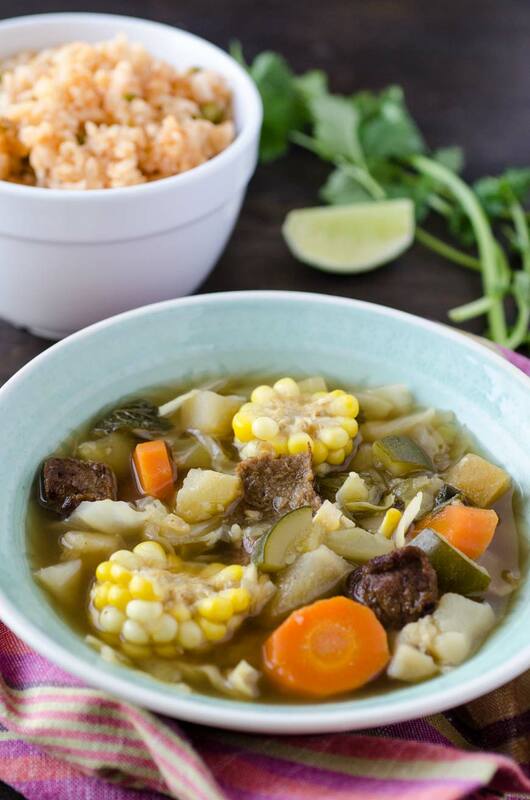 This vegan Mexican meatball soup is a hearty soup filled with carrots, potatoes, celery, and amazingly tender meatballs. Enjoy! First you will need to dice the tomato and onion. Make sure they are not large pieces. You're going to sauté that with the 1 tablespoon of cooking oil in a large cooking pot that you will also be cooking the albondigas in. 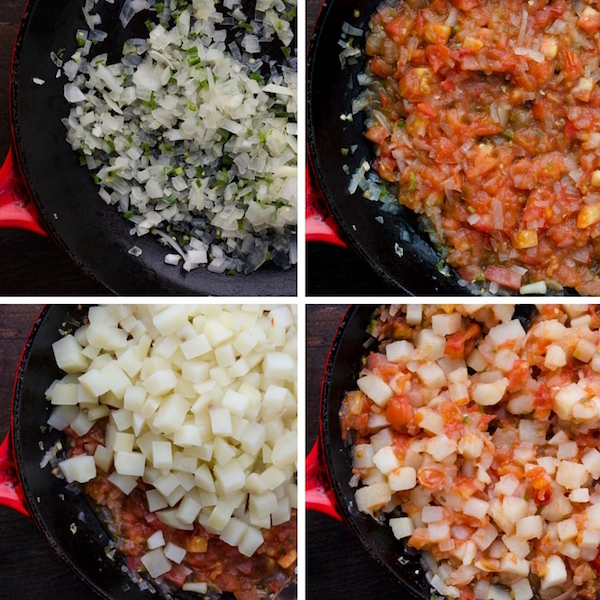 After you're done sautéing the tomato and onion, you will add water. Depending on how large the pot you're using, add water to about 1/2 or 3/4 of the pot will work. Use your best judgement. (Remember you will be adding vegetables later so make sure there is enough water for the soup.) Bring to a boil. Once it's boiling, add salt, and vegan flavorings. Two of the not chicken and two of the vegetable bouillon cubes. (Depending on if you get the low sodium, you will need to add a lot more salt for flavor and taste until it's to your liking). Pepper is optional to add for flavor. Next comes the making of the albóndiga. I recommend only Gardein ground beef. As it doesn't crumble as easily. Make sure you defrost it beforehand so it is not frozen. 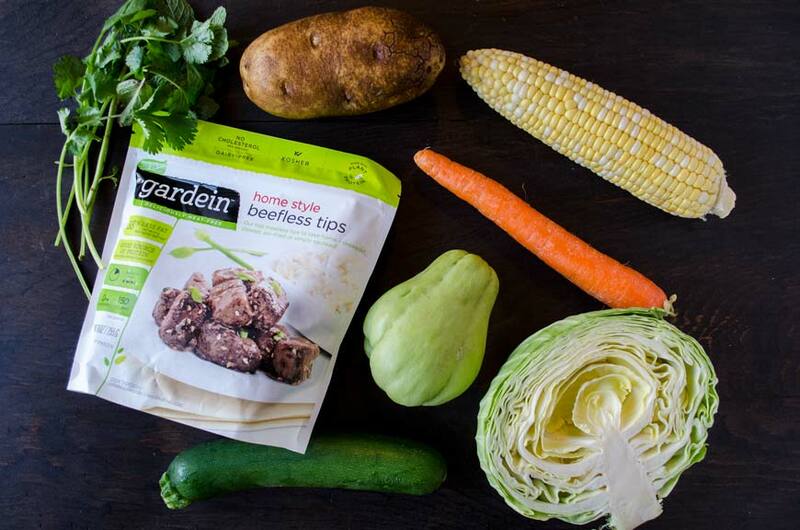 Grab a bowl, and add the package of Gardein beef. Then add 1 teaspoon of black pepper, 1 teaspoon of garlic salt, and 1/3 of the white rice. Mix all together and add about 5-6 finely cut mint leaves into the mix. Adding the vegan egg last is easier as it can become messy. 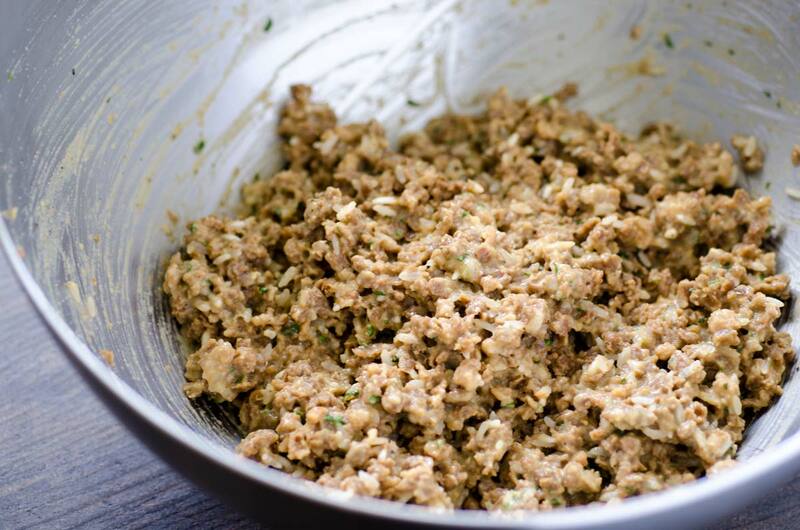 You will need to make about 2 vegan eggs, and when mixed properly add it to the ground beef mixture. Make sure it's eggy enough to form an albóndiga that stays in shape. Mix all together and form the albóndigas (Meatballs). 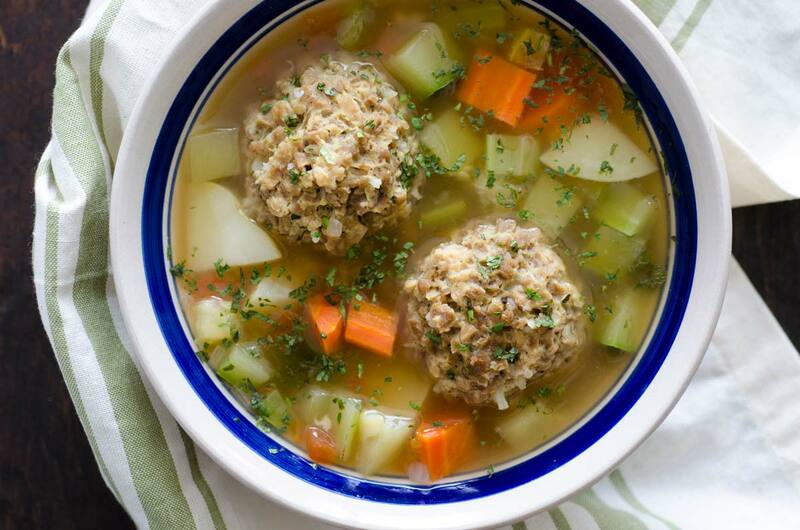 One bag of the gardein beef will make about 6 very large albondigas, or even 10 small albondigas. However small or large you shape them, that number can drastically change. As soon as the vegan flavorings, salt, and or pepper have been added and mixed in well and it's been boiling, add the albondigas. It's crucial that once you've added in the albondigas to make sure that when you stir it around you're not making very much contact with the albondigas as you don't want them to fall apart but to keep their shape. Cook for 15 minutes or so. Meanwhile chop up carrots, celery, and the calabaza. Do quarter cuts for the potato. 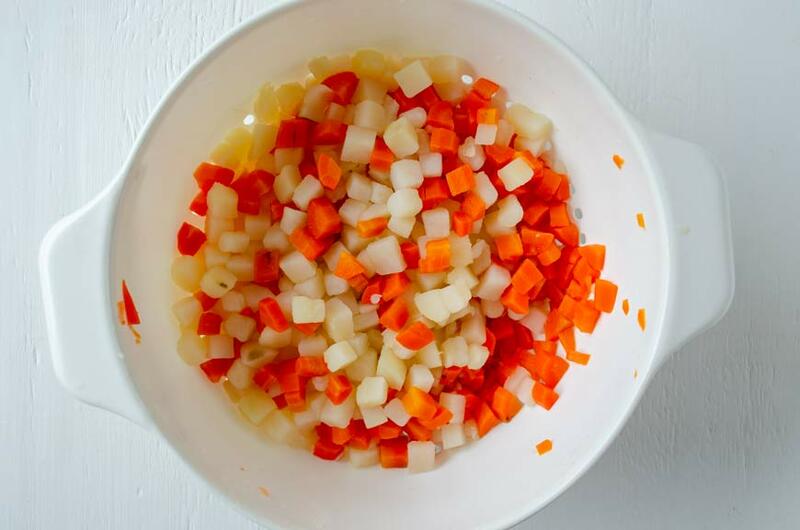 Add the cut up carrots, celery, calabaza, potato and yellow peppers (do not cut). You can lower this from boiling to medium low until vegetables are cooked. Cover pot and let it thoroughly cook together for about 15 minutes then add cilantro for finishing touch and let cook for a few minutes and you should have vegan albondigas! Don't forget the warm tortillas! Or even avocado slices! 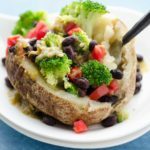 10/03/2016 /8 Comments/by Dora S.
Who doesn’t like a stuffed baked potato? There’s nothing quite as satiating and versatile as a potato. This Mexican stuffed baked potato is my go-to lunch. It is made with ingredients I usually already have in my fridge. 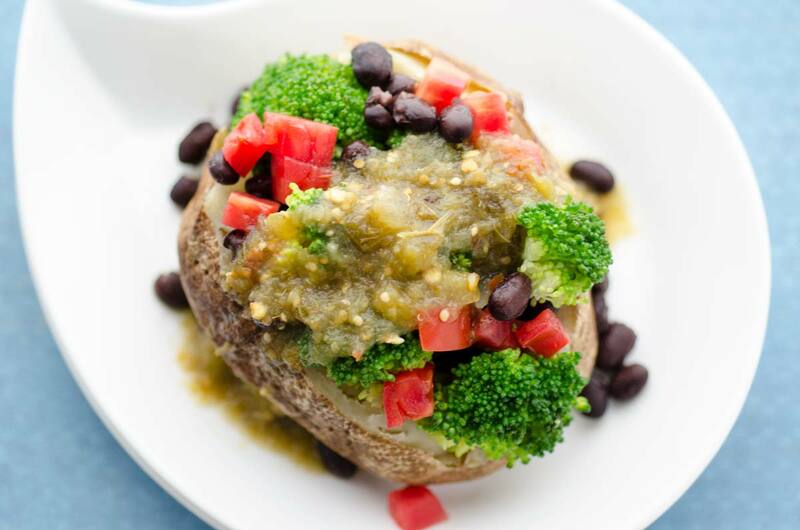 I just pop the potato in the microwave and stuff with broccoli, black beans, chopped tomato, and salsa verde. 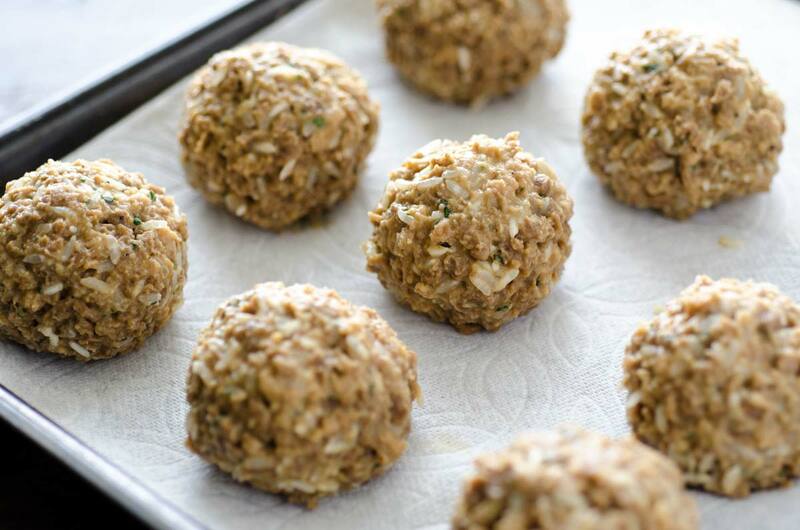 It hits all the right spots and it is packed with approximately 18 grams of protein. Hawaii keeps surprising me at every turn. I have joined a Catholic homeschool group to get to know some other families and ask all the questions possible about homeschooling before we make our decision. 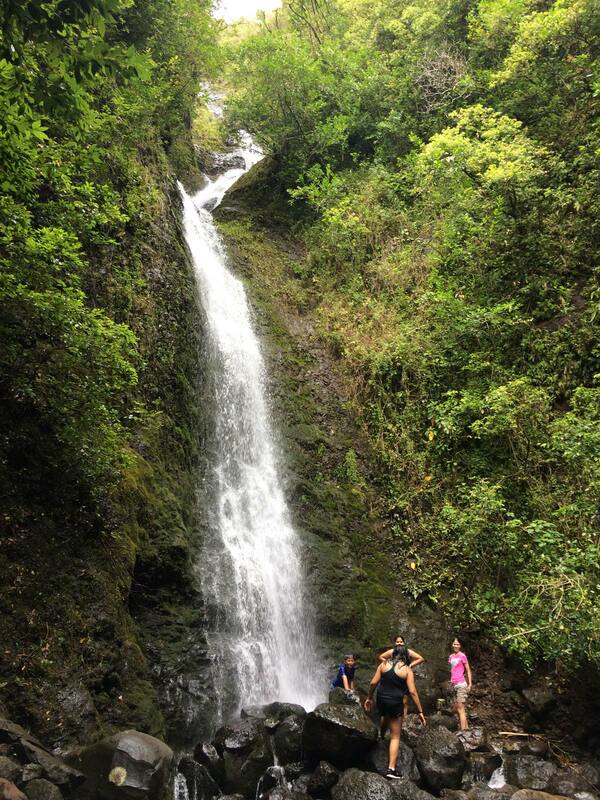 Recently we went on a hike with the group to Lulumahu falls. It was amazing, but if I had known it was going to be so challenging I probably wouldn’t have gone! I was wearing my 2 yr old on my back, and I think she weighs about 29lbs. 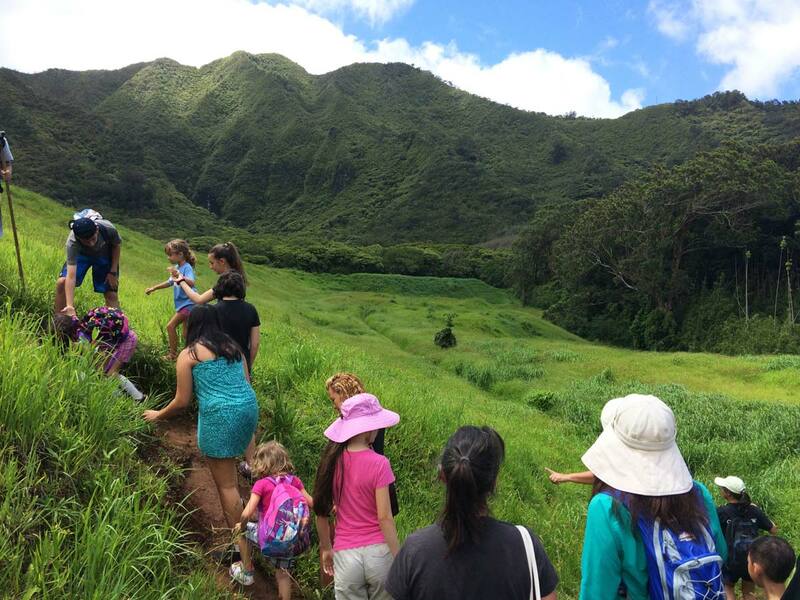 One of the moms assured me the hike was kid friendly, but that I should wear shoes because we would be walking through water. I thought to myself that we would probably cross a small stream or something. We climbed over boulders, crouched under fallen trees, walked through several streams, and walked deep into the rainforest. It took us about an hour, but we ended up at a beautiful waterfall. 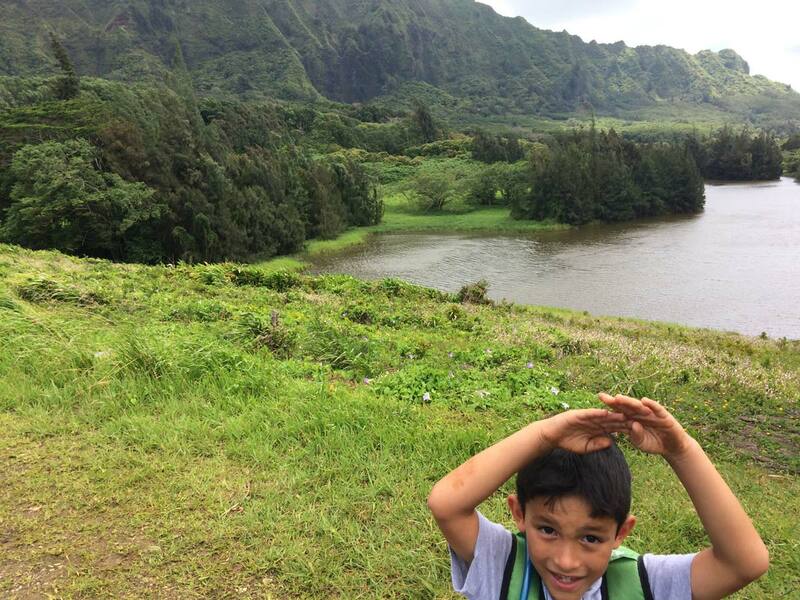 Dylan kept saying, ” Mom, this is a real adventure! !” It really was, and mommy felt it all over her sore muscles the next day. 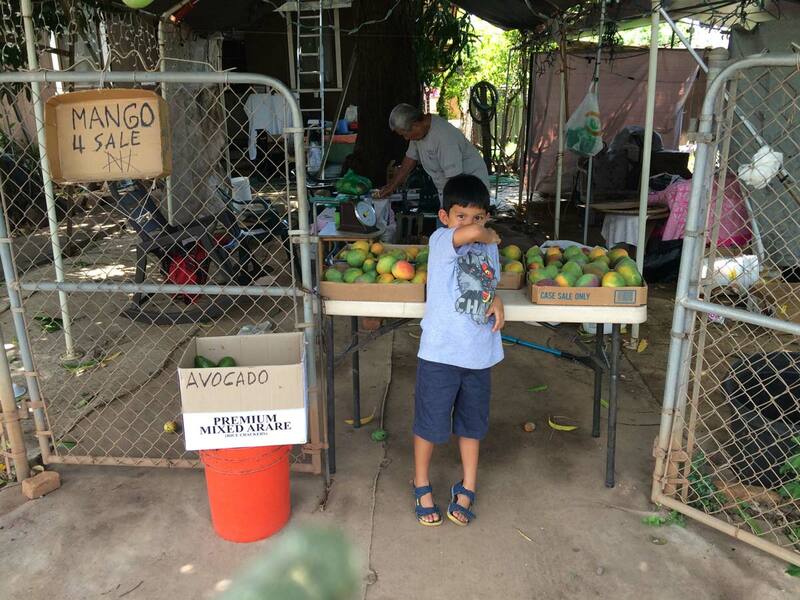 The other day we passed by a house that was selling mangoes. 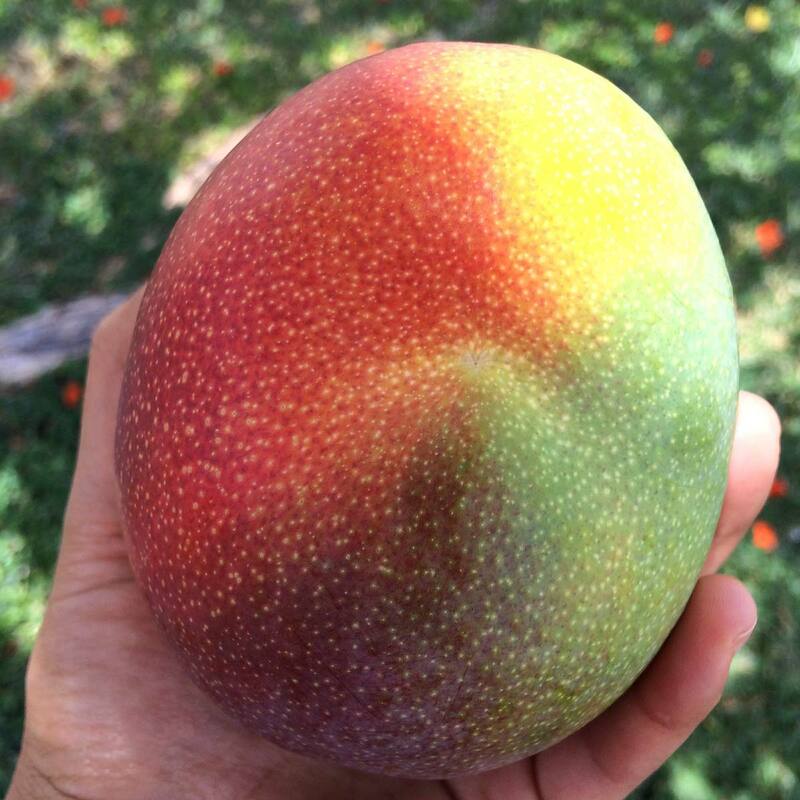 Their yard was riddled with giant mango trees, the bright yellow, red and green mangoes weighing down the branches. They were selling them for $1.50 a pound so I bought 6 lbs. I have to say the mangoes were some of the best I have ever tasted. The kids are eating them faster than I can peel them. Another day we were at the beach, and there was a beautiful woman sitting there staring at the sunset. There were hardly any people left at the beach, since it was so late. I kept staring at her because I though she was so beautiful with her long black hair and dark skin. All of a sudden she broke out a ukulele and started playing. I was so mesmerized I couldn’t find my phone in time to record her. It was a beautiful spontaneous moment that can best depict what living in Hawaii has been like so far. I hope there are many more beautiful moment to come! This recipe is incredibly easy to make and very adaptable. If you don’t have broccoli you can use zucchini. You can also add corn or cilantro. The possibilities are endless. I decided to use salsa verde because I really like it, and I had it in the fridge that day, but you can use any salsa you like. If you are looking for something more creamy you can use this spicy chipotle cream. Enjoy! Cook potatoes on high in microwave for 5 minutes or bake in oven at 425F for 50 to 60 minutes. 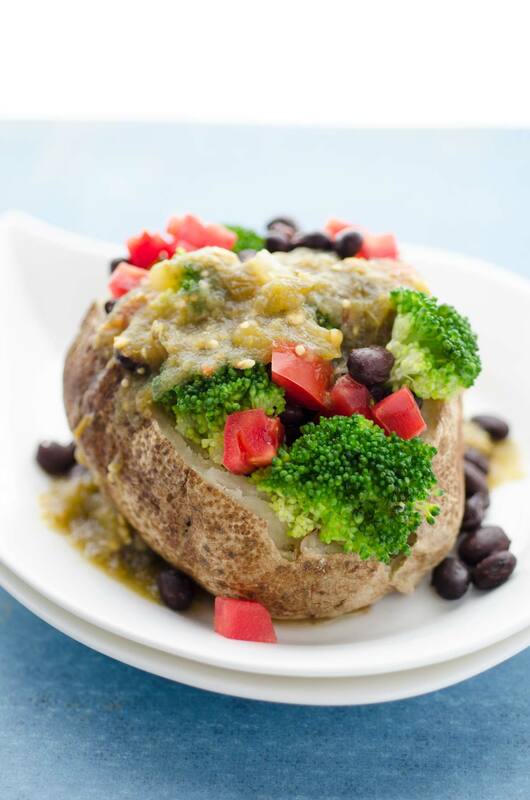 Make a cut lengthwise in the potatoes and stuff with cooked broccoli, black beans, and diced tomato. Pour salsa verde over the whole thing. You can add corn and cilantro or any other vegetable you like. You can also use any salsa you like. If you are looking for a more decadent sauce you can use this chipotle cream sauce. 06/20/2016 /0 Comments/by Dora S.
I’ve spent the last week feeling overwhelmed and incredibly empowered. 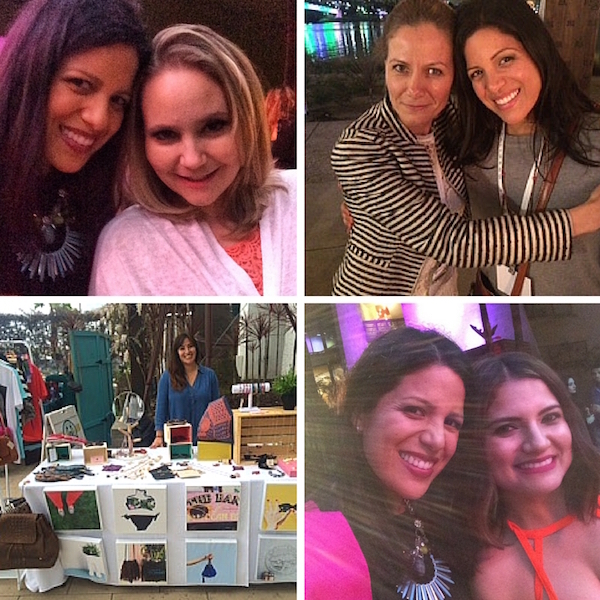 The first weekend of March, I attended a conference for Latina bloggers called #WeAllGrow Summit. The conference was 3 days long and it was amazing! It is organized by Ana Flores and the team at Latina Bloggers Connect. 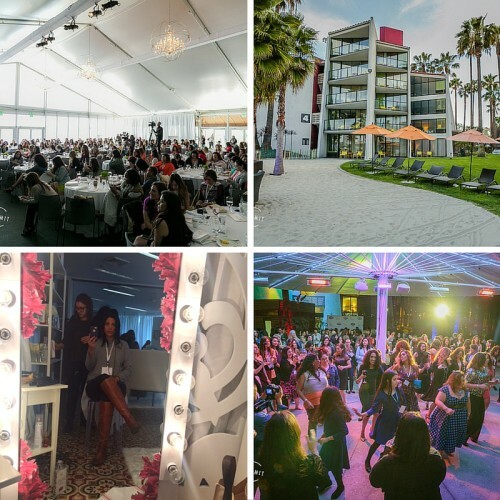 Imagine over 300 Latina women (a couple of men too) in the same place. The conference tag line is, “If one grows, we all grow,”and that is precisely what it was meant to do and did. I was very nervous at first, because I was going alone and I am incredibly awkward in large social situations. I am a total introvert, and speaking to so many people can be intimidating. I had nothing to worry about though. Everyone was very welcoming and friendly and I met so many women that are doing remarkable things with their blogs and businesses. I’d like to introduce you to a couple of them. There’s Laura and her sister Catalina of Las Recetas de Laura and Spicy Latina Mom. They are both from northern Mexico like me, so it was great to meet other norteñas. They have a healthy Mexican food blog and a youtube channel. I finally got to meet Alejandra Graf from Piloncillo & Vainilla, a fellow vegan blogger, and a real sweetheart. I want to publicly say a huge thank you to two special ladies Diana Cortes and Ana Cruz. They embraced me and made me feel welcome when I didn’t know anyone, and was kind of wandering around trying to find someone to talk to. Diana has a really cool online boutique that curates Mexican made shoes, clothing, home goods, and accessories. All of their items are very unique and beautiful. Ana Cruz is a talented radio host, and lifestyle blogger at Rollos de Mujeres. 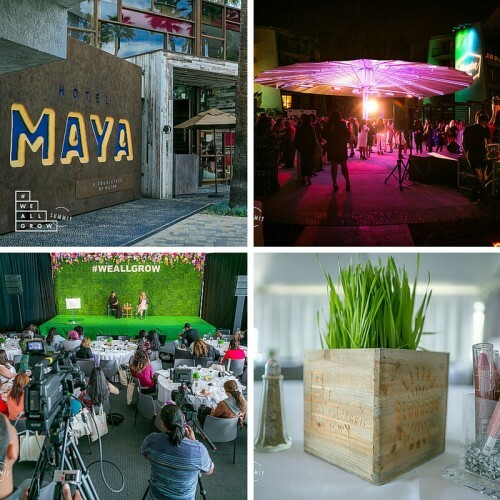 Besides socializing and connecting with other bloggers I was also able to attend several conferences, and I learned quite a bit from them. We are now working on starting a youtube channel and seriously upping our social media game. There are so many things to do, and not enough time for all of them, especially when we are trying to run two blogs at the same time. Something did happen at the conference that impacted my life for the better and opened my eyes to a whole new world. I was born and raised in Mexico and came to this country about 12 years ago. It took me leaving my country to truly appreciate it, but leaving also gave me an increased sense of pride of where I came from. Let’s just say my “mexicaness” increased by 75%. In the beginning most of my sentences started, ” Did you know that in Mexico…” However, whenever I met someone who was 1st or 2nd generation American, but identified themselves as Mexican, I was quick to correct them and say that they actually weren’t. For me back then being Mexican meant that you were born in Mexico. Which technically is still true, but what does it really mean to be Latina now? Do you have to speak Spanish? Are you less of a Latina if you don’t? What if you don’t look Latina? The women at the conference answered all these questions for me with their beautiful selves, with their pride in their roots (even if their Spanish wasn’t perfect), and with their desire to pass the language and culture along to their children. There is no longer one definition of what it means to be Latina. I just hope my children will one day be like all the women at #WeAllGrow, and identify themselves as Latino, and proud of it! Now that I’ve talked your ear off, let’s get back to the cooking. I really don’t like tofu scrambles. Maybe I just haven’t had a good one, or I enjoy real eggs too much to accept tofu as a substitute. The one thing I do enjoy is a savory breakfast every once and a while. When I am looking for something savory and satisfying I make this Mexican potato scramble. I just substituted the egg with potatoes, and followed a very traditional recipe for making Mexican scrambled eggs. The result is a spicy, savory and satisfying dish with all the flavors of Mexico. 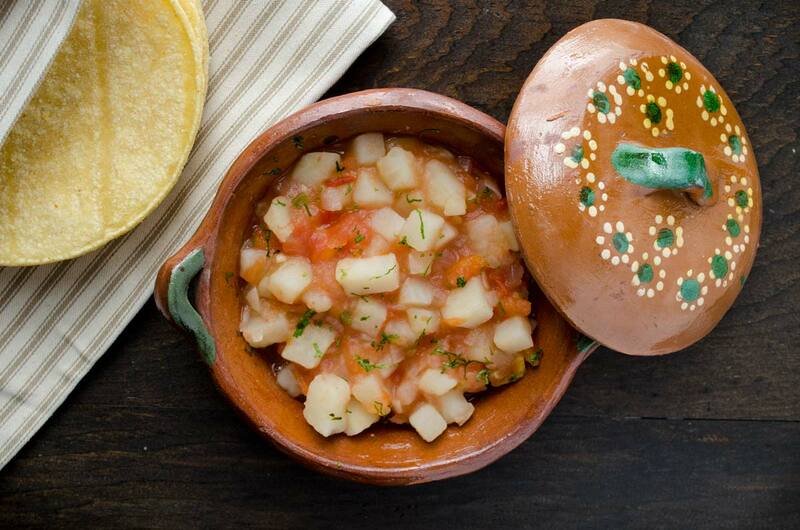 Serve on warm corn tortillas, and if you’re brave enough, some hot salsa. Enjoy! Fill a large pot with cold water and the diced potatoes. Bring to a simmer over medium heat, and let cook for about 6 minutes or until the potatoes are tender, but not mushy. While the potatoes are cooking, heat a large sauté pan to medium-low heat and add the onion and serrano peppers. Cook the onion and peppers for 3-4 minutes or until the onion is tender and translucent. If the onion begins to stick add some water or vegetable stock to the pan. Add the diced tomatoes to the pan and cook for about 6 minutes, or until the tomatoes begin to break down and become more of a sauce. Drain the potatoes, but reserve 1/4 cup of the potato water. Add the potatoes and the potato water to the pan. Mix well and cook for 1 more minute. Season with salt and pepper and serve with warm corn tortillas and salsa. 03/16/2016 /2 Comments/by Dora S.